1975 - race | Yamaha Motor Co., Ltd.
View an archive of races Yamaha competed in 1975. Yamaha wins both the rider and constructor titles!! G. Agostini won the opening round in France. H. Kanaya takes 2nd. Agostini won the opening round in France. Hideo Kanaya, also on the YZR500, won the following round in Salzburg, while winning that round's 350cc class race as well. Agostini won the following races in West Germany and Italy. After the Isle of Man race, which many of the main contenders chose not to participate in, Agostini, Sheene and Read battled in the lead at round six in the Netherlands. Sheene eventually took the win, his first ever in the GP500 class. Agostini crossed the finish line 2nd by a hair's breadth. Read came on strong in the second half of the season to bring the championship race down to the last round of the series in Czechoslovakia. 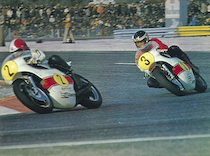 In the title ride-off, Agostini's point lead meant that he only had to finish in the top seven to win the title, even if Read won this final 17-lap race. Sheen and Lasivuori on their Suzuki machines were in the mix battling for the lead in the early going, but both eventually retired from the race. Agostini chose not to duel with Read, who was running at the front. He was content to finish 2nd and seal off his championship title. This gave Yamaha its first rider's championship in the pinnacle class of motorcycle road racing. Yamaha also took its second GP500 manufacturer's title in a row. Kanaya, who was ranked high in the early part of the series, did not participate in any races from mid-season on. In the 350cc class J. Cecotto takes the championship. Yamaha riders won 10 out of the 11 rounds in the series. Cecotto was crowned champion after winning four races. This was the second consecutive year that Yamaha riders had taken the rider's championship. Yamaha also took the manufacturer's title for the third year in a row.